In Lenexa, Mission, Shawnee, and the other surrounding areas of Overland Park, the summers get hot and humid, and the winters cool and damp. In every season, you need your air conditioning to work to its full capacity to keep you comfortable. But did you know the air conditioning is crucial to keeping your windows clear as well in the humid and cold weather? Your A/C pulls the moisture from the air to eliminate the fog on your windows. The number one reason an A/C system does not cool is because it is low on refrigerant from a leak. Our A/C-certified technicians use specialized methods to find the source of leaks. Should a leak be so small it is undetectable, we can recharge the system to produce cold air, then add fluorescent to find the leak at a later date. Even without a major leak, your A/C system loses up to five percent efficiency every year due to compressor wear, dirty cabin filters, condenser and evaporator restrictions. The electronic HVAC controls can malfunction. Mold can develop from dirty cabin filters and moisture accumulation. This means you’ll need auto air conditioning repairs eventually, no matter the condition. When you need auto air conditioning repairs in Overland Park, trust your vehicle to the experts at New Concept Auto Service. With 30 years as an AAA-approved business, our team has proven time and time again that we have the knowledge and expertise to diagnose and perform every A/C repair you may need. Auto repairs aren’t a guessing game. At New Concept Auto Service, we pride ourselves on a thorough, accurate diagnosis for every auto air conditioning repair that comes through our doors. We have three ASE-certified master technicians who are thoroughly trained and experienced in using cutting-edge diagnostic equipment to accurately find and repair every A/C problem. Whether your Chevrolet Camaro requires a new evaporator core, your Dodge Caravan needs a new compressor, or your Audi simply requires an A/C service and refrigerant recharge, we are equipped to efficiently tackle the job. 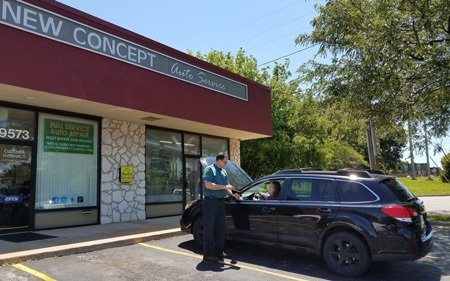 For auto air conditioning repairs at New Concept Auto Service, we always use original equipment or high-quality aftermarket parts to guarantee long-lasting results. Call us or use our online appointment form to schedule your A/C repairs today! At New Concept Auto Service, you can rest assured that an ASE-certified technician is working on your auto air conditioning repair. We have the expertise and training to repair any concern that pops up, from fluid leaks to worn out parts. We perform auto air conditioning repairs on all domestic and import models, regardless of the vehicle’s age. We have the necessary diagnostic tools and the repair technology to efficiently and accurately perform your auto air conditioning repair right the first time.